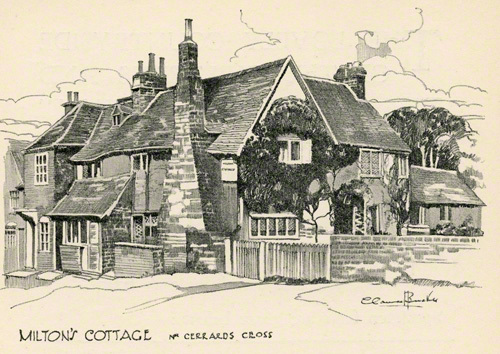 A very detailed pencil drawing of Milton's Cottage by Claude Buckle. Milton's Cottage is a timber framed 16th century building located in the Buckinghamshire village of Chalfont St Giles. In 1665 John Milton and his wife, moved into the cottage to escape the Plague in London. Despite the fact that Milton spent less than a year at the cottage, it is important because of it being his only residence in existence today(2014). While at the Grade 1 listed sixteenth-century cottage Milton completed his best known work, Paradise Lost. Gerrards Cross was the next biggest town (at that time) to the south. Created in 1935.